The entire experience as a whole was absolutely fantastic! Our team leader, Maggie, was wonderful and always there when we needed her. The tías were all so welcoming and full of energy. Even though they didn’t speak English very well and we spoke basically no Spanish, they found ways to convey what they wanted us to do. My charades game is stronger than ever after my trip! Lastly, the children were adorable and so fun to play with. Walking in the doors of the daycare to hear a chorus of “Hola!” coming from the breakfast tables is something that I will never forget and that I hope many others have the opportunity to experience. One of the most exciting things that happened while in Ecuador was the presence of the Pope! One Tuesday the daycare was shut down along with many stores in Quito due to the Pope being there and giving mass in a park that was very close to our hotel. We decided to avoid the area since they were predicting a rather large crowd to show up, but just being in the area before and after his visit and seeing the impact that it had on Ecuadorians was phenomenal. There was so much merchandise with “Papa Francisco” on it; shirts, mugs, necklaces, and so much more. The atmosphere in Quito was wonderful the entire time we were there but the anticipation and excitement of the Pope’s visit was so contagious and such a wonderful experience. I would tell people who may be considering a student volunteer trip with Global Volunteers to jump in head first. This is the opportunity of a lifetime and I truly believe that the children and tías in Ecuador made far more of an impact on me than I can even imagine I could have possibly had on them. I learned that smiles and laughter are a universal language and “teamwork makes the dream work” among many other life altering lessons. This experience has changed my life for the better and I find myself already attempting to plan my next student volunteer trip through Global Volunteers. What better way to see the world than to see it through service? 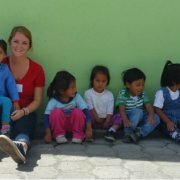 Interested in an Ecuador Student Volunteer Trip? Visit Global Volunteers’ Volunteer in Ecuador website page to learn more about opportunities in Quito. Or, chat online with one of our Volunteer Coordinators. We’re ready to assist you with project descriptions, travel questions, registration guidance and other program details.